Throughout his life, Luce created a prodigious amount of art: 4,000 paintings and nearly 3,000 drawings, lithographs, etchings and wood engravings. A precocious child, Luce was encouraged by his father to become a wood engraver by trade. While serving his compulsory military training he was fortunate to be stationed in Paris and enrolled in the Academy des Beaux-Arts to study painting. As a child he was exposed to many atrocities committed during the 1870 Commune uprising of Paris. This left an indelible mark on him and was reflected in his work for the remainder of his career. Committed to conveying the sorrows and difficulties of the common people, Luce painted and drew them in their daily activities, whether ditchdiggers, woodcutters, or masons. His ability to depict the human figure separated him from many other artists of the time. Although Luce painted scenes of destruction and difficulty his more bucolic landscapes occupied the dominant part of his work. Luce first exhibited at the Salon des Independants in 1887 and continued to do so for the remainder of his life. His paintings done according to the theory of a division of tones (somewhat comparable to the work of Seurat), attracted much interest. As a working man, Luce was not in touch with the progressive circles of contemporary artists, but Camille Pissaro, impressed by Luce’s work, asked to be introduced. Through Pissaro, Luce was immediately accepted into the Neo-Impressionist group. Seurat and Signac received him and he became acquainted with Armand Guillaumin, Dubois-Pillet, Angrand and critics such as Félix Fénéon and Jules Christophe. In February of 1889, Luce was invited to exhibit with Les Vingt in Brussels, along with Besnard, Braquemond, Cross, Desboutin, Frémiet, Gauguin, Pissaro, Monet and Seurat. Luce was now at the very centre of the movement. Luce painted many views of Paris and landscapes of the suburbs and it was without doubt the Post-Impressionist technique used to best effect. Luce was very much admired by the avant-garde critics and exhibited regularly with the avant-garde artists at the Galerie des Beaux Arts. This canvas depicts construction and change in Haussmann-era Paris, particularly the boring and widening ot la Rue Réaumur. The street was created as an East-West artery during the Second Empire, and it runs from Temple Square to the Stock Exchange. It serves as an important chronicle of the city’s renovation at Haussmann’s direction, speaking to the creation of the arrondissements and the modernization of the city at large. Here, Luce continues the theme of the urban landscape, utilizing figures and traffic as element to create action in his composition and breathe life into the image. 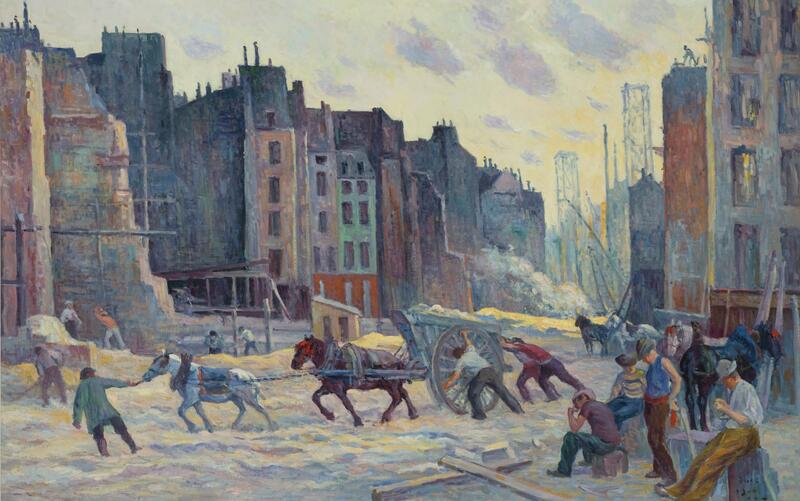 Like Pissarro, Luce championed the common man and his pursuits; here he concentrates on the intensity of the labor required to renovate the city. Luce was fond of depicting the proletariat class, and his subject matter was considered by some as Socialist in theme. 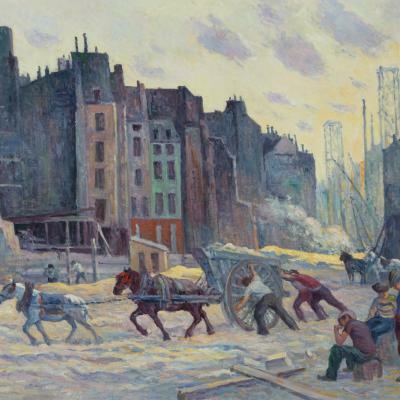 Please notify me when works by Maximilien Luce become available.